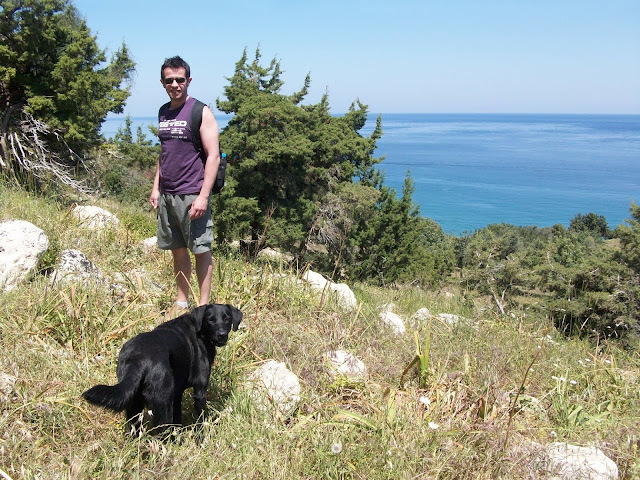 While we were enjoying a break earlier this year in the west of the island (staying at Chloe's House, Pano Arkourdalia see post 9/6/2013), we took the chance to do a bit of hiking around the beautifully unspoilt Akamas Peninsular. We were there in late April, and it was perfect - very few people around, lovely warm weather but not too hot to move - for anyone lucky enough to be in Cyprus in the Spring, I strongly recommend a trip to this area. Not knowing the area at all, I followed the advice of my Lonely Planet and headed for the Aphrodite Nature Trail, that begins from the Baths of Aphrodite. I've read a few negative reports of the Baths. It is basically a small spring surrounded by lush vegetation, no more, no less. We stayed there for about 2 minutes as there were coach loads of tourists filing through taking photos, and, of course, we had our dog Sage with us so crowds are to be avoided. 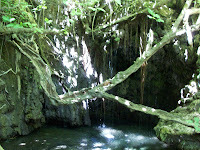 From the baths you follow signs for 2 nature trails: The Adonis and The Aphrodite. We chose Aphrodite, and I'd love to go back and walk the other trail too. I should say here, we actually managed to miss the signs, and do the trail in reverse. I'm not sure if this made it more difficult ... perhaps a bit. 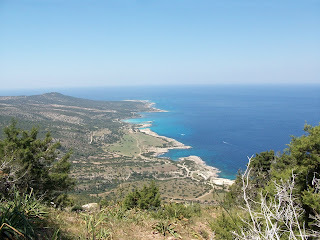 The start of our backwards Aphrodite Trail took us along a flatish trail, next to the sea. After about 30 minutes, we started to ascend, and this was pretty hard work. There are, however, benches and view points to stop along the way, with fantastic views out over the peninsular. We were climbing (slowly) for another half hour or so. Once you finish the climb there are a few possible paths - we found markers on some of the rocks and followed those. We also found one possible route blocked by a pair of intimidating goats with the biggest horns I've ever seen. I pretended I was only concerned on Sage's behalf, not for my own safety of course, and we headed in the opposite direction pretty fast. 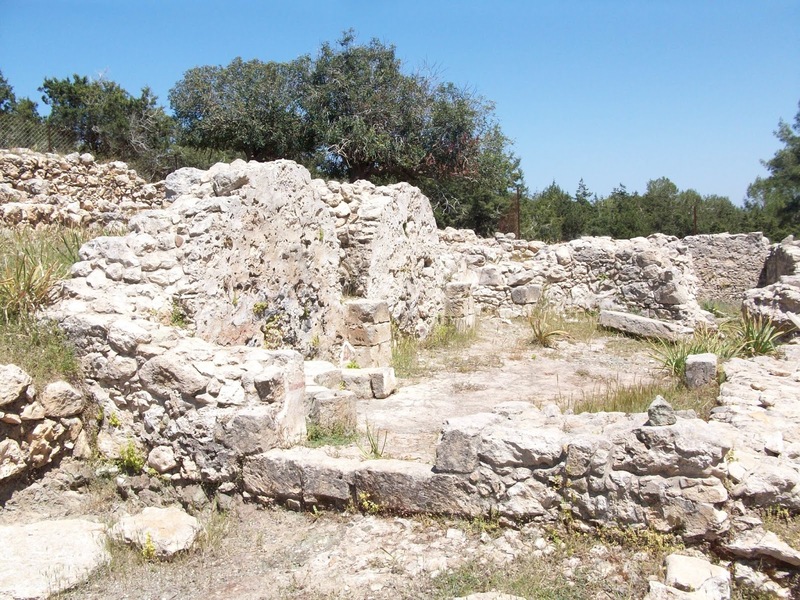 The route flattens out, and you finally come to a wonderfully shady grove, with fresh spring water for thirsty dogs, a majestically old and large tree, and the ruins of the Pyrgos tis Rigainas (Queen's Tower). Not much remains of the Tower, but it's isolated location, especially coming across it after a long, hot walk, makes it seem quite romantic. You can find small fragments of painted wall plaster still adhering to the bases of some walls. 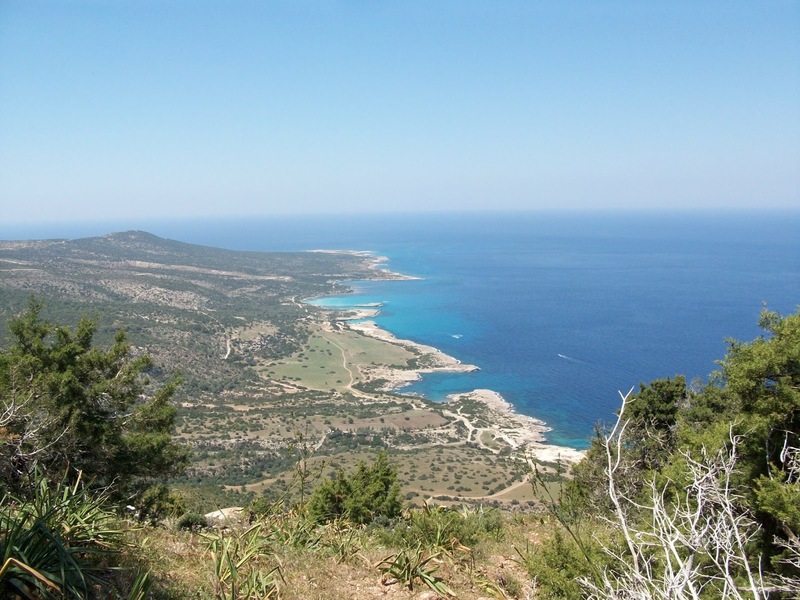 This is the point where, had you gone the right way on the trail, you would part company with the Adonis Trail, which winds up through the mountains and inland, while the Aphrodite descends slowly down by the coast. From this wonderful resting point, our route was all downhill (i.e., usually the trail begins with this fairly steep, but shorter ascent). Soon enough we came in sight of the coast and our starting point. 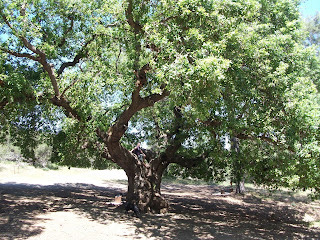 It took us about 3 hours, with a longish stop at the Tower (admiring wall paintings and climbing trees). Nature trails go from near sea level past carob, mastic and eucalyptus climbing up to juniper and pine. Along the way you can see rare endemic plants, like the Cyprus orchid, tulip and crocus. This is a great hike to do with your dog any time other than high summer - there is little shade along the way, except for by the Queen's Tower. You should carry water with you, although you can fill up again at the Tower (potable water). I found this trail quite hard going, but there wasn't any scrambling and the path was quite well maintained. The trail is circular, 7.5 km, and categorised difficulty level 2/3. Apart from goats, and heat, this is great for dogs - Sage spent a very happy morning chasing lizards and bounding up the path.